Gently and reliably guides children and parents through essential maths concepts, starting with numbers and counting. Covers the concepts needed in the first few years at school with brightly illustrated clear definitions of over 500 key terms and concepts. Can be used as a dip-in dictionary, or to work through to build knowledge and skills step-by-step. Includes internet links to the best interactive websites offering maths puzzles, games and practice at this level. Get yourself a copy of this book, and next time your child has homework on tree diagrams, symmetry or number lines (and lots more) you will have the confidence to help. Practical and easy to use. 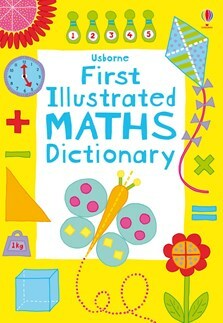 The Usborne First Illustrated Maths Dictionary and it’s Science counterpart are every parent/carer’s best friend! No more tricky homework explanations- these books are easy to use and have fantastic illustrated examples throughout. The science dictionary explains terms and gives ideas for experiments and projects and the maths dictionary uses plain everyday language to explain and illustrate maths concepts to children (and the grown ups scratching their heads next to them).